Depay pictured after signing with Lyon today. 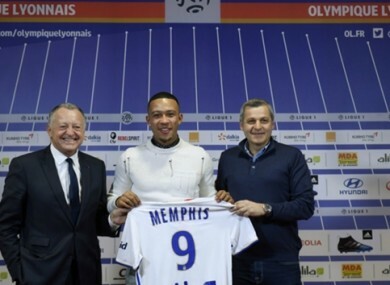 LYON HAVE CONFIRMED the signing of winger Memphis Depay from Manchester United. It is understood that the Ligue 1 outfit have paid an initial fee of £15 million (€17 million) for the Netherlands international, though that could rise to £21.7m (€25m). Memphis joined United from PSV in the summer of 2015 but struggled to hold down a regular place under both Louis van Gaal and Jose Mourinho. He leaves Old Trafford just 18 months into his four-year contract having scored just seven goals in 56 appearances for the 20-time English champions. He has made just eight substitute appearances for the Red Devils this season, with his Premier League outings amounting to just 20 minutes of action, and becomes the second high-profile departure from United in the January transfer window following Morgan Schneiderlin’s move to Everton. 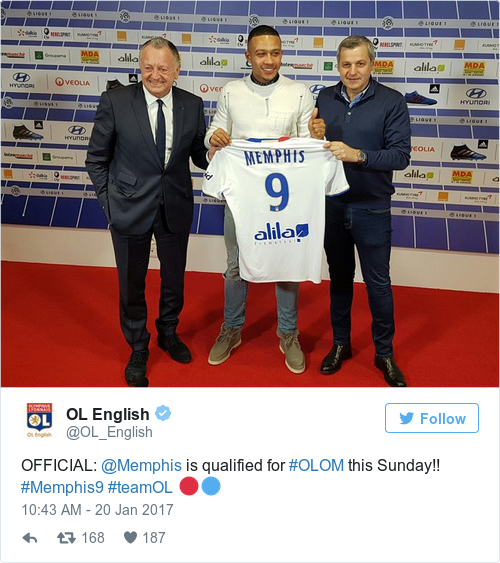 Memphis will wear the No.9 shirt for his new club and could make his debut against Marseille on Sunday. Speaking following the news, Depay said he does not have any negative feelings about Manchester United having swapped Old Trafford for Lyon. I am not looking for revenge on Manchester United or anything,” the 22-year-old said at a news conference. “I just want to show what I am capable of again, just like I have done in the past. “I played with some great players at United, like Wayne Rooney, Zlatan Ibrahimovic and Paul Pogba. I learned a lot from them and took all of that on board. I learned that it was necessary to adapt to a new team, a new style of play and a new league. I now have to prove myself again. The project at OL was more complete than what other clubs could offer. I felt that coming here was the right move. I follow all the leagues and I know OL are a big club that has won a lot of titles. Email “Lyon complete €17 million signing of Memphis Depay from Man United”. Feedback on “Lyon complete €17 million signing of Memphis Depay from Man United”.